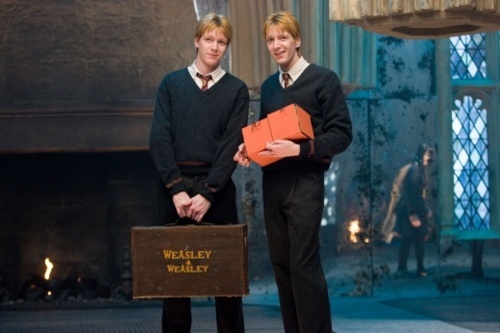 Happy Birthday, Fred and George Weasley! J.K. Rowling knew what she was doing–has there ever been any doubt?–when she chose April 1 as the unforgettable day Fred and George Weasley were welcomed into the world. 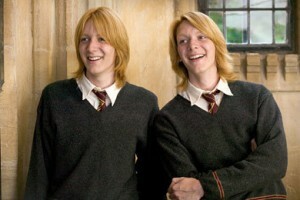 It may be known as April Fool’s Day, but Fred and George were no fools. They loved a good laugh, and the more the better. But more than that, they loved a good joke, and they managed to combine their penchant for light-hearted hilarity and magical skill into a thriving entrepreneurial venture as students at Hogwarts and, later, as the owners of Weasleys’ Wizard Wheezes joke shop. Quite the feat of transfiguration! More than their business sense, their instinctual quick wit and self-confidence drove their ability to approach every circumstance and opportunity with good humor. We could fill an entire volume with their quips alone! 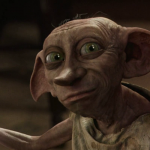 But, in honor of their birthday and in hopes of garnering some genuine April Fool’s Day laughs, lets remember some of their funniest outbursts and antics from the Harry Potter series. 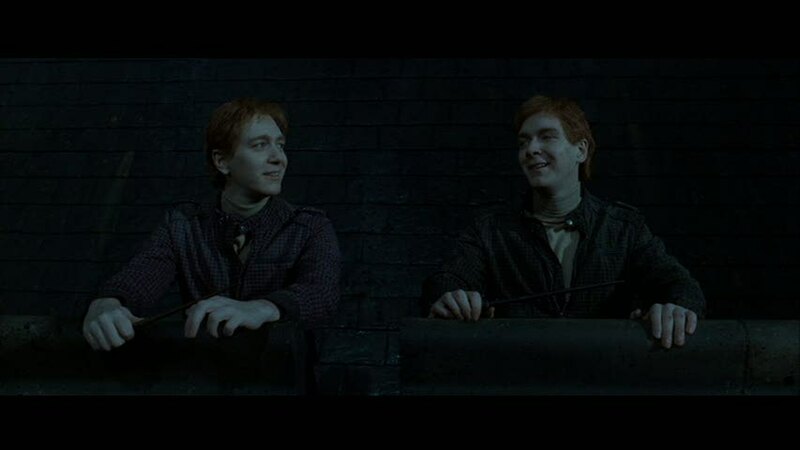 Fred and George may have delighted in teasing their siblings and pulling pranks that gave their parents more than a few gray hairs, but joking aside, they loved their family with unabashed devotion. When other kids their age might have shied away from wearing homemade sweaters and sitting with their annoying brothers, they did so proudly, and we love that about them! ‘I hate maroon,’ Ron moaned half-heartedly as he pulled it over his head. And later, upon spying older brother Percy, who they delighted to pester over his head-swelling prefecture, there was no avoiding a spot of togetherness. ‘I – don’t – want –’said Percy thickly, as the twins forced the jumper over his head, knocking his glasses askew. 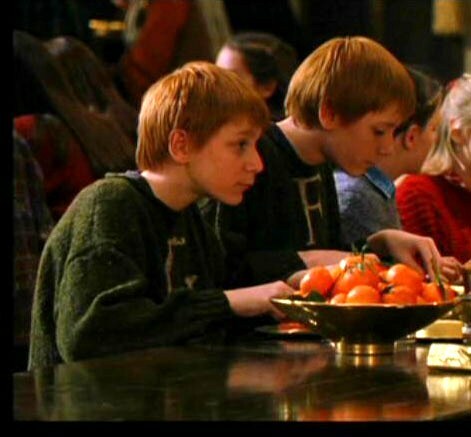 ‘And you’re not sitting with the Prefects today, either,’ said George. They frog-marched Percy from the room, his arms pinned to his sides by his jumper. ‘It is not a laughing matter,’ he said coldly. ‘Yeah, he’s nipping off to the Chamber of Secrets for a cup of tea with his fanged servant,’ said George, chortling. They also had a knack for being in the right place at the right time–that is, for picking up useful information and avoiding trouble. (It doesn’t count if you’re not caught, right? That was their philosophy, at any rate.) And in the case of their older brother, it really ought to have helped Percy take himself a little less seriously. Fred dropped a stack of books on George’s head. … ‘You won’t tease him, will you?’ she added anxiously. ‘Wouldn’t dream of it,’ said Fred, who was looking as if his birthday had come early. ‘Definitely not,’ said George, sniggering. Fred and George had their own curious set of priorities and ambitions, and they differed from those of their siblings. They were loners in that way, but they were confident, and they had each other. They knew what they were good at and endeavored to excel, not bothering to waste time on the things that didn’t matter to them. That said, they were remarkably generous. They didn’t need to achieve success in the eyes of their professors or peers, but they more than succeeded in other ways–as teammates and as friends. ‘This, Harry, is the secret of our success,’ said George, patting the parchment fondly. ‘And what do I need with a bit of old parchment?’ said Harry. Fred and George decided to put their interests and skills to good use, maximizing their talents. And considering their cleverness, their family really ought to have known they’d find a way to do so. They weren’t completely in the dark, of course. Mr. and Mrs. Weasley knew them far too well for that. 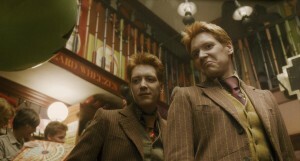 How far Fred and George had come with their gags and magical products, that was the surprise! ‘What are you two up to?’ said Mrs Weasley sharply, her eyes on the twins. ‘Don’t be ridiculous, you’re still on holiday,’ said Mrs Weasley. If thinking they could trick Dumbledore’s age-line wasn’t humorous enough, their knack for a well-timed sarcastic aside continued to be invaluable in alleviating tension, especially as Harry faced the challenges of the Triwizard Tournament. And who can forget their hilarious approach to avoiding the teen angst of finding a date to the Yule Ball?! Simply have confidence in yourself and refuse to be dragged into it–the more straightforward and blunt the better. 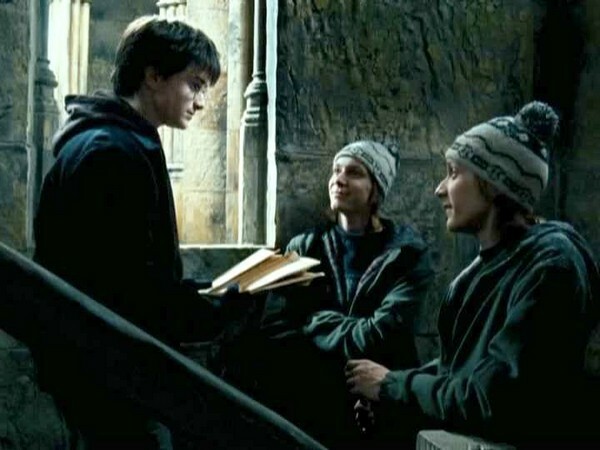 Given the rollercoaster ride of drama that was Ron and Hermione’s relationship for seven books, Ron might have taken his brothers’ example to heart. 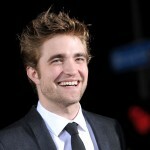 (Or one of them might have pulled him aside and talked a bit of sense into him. 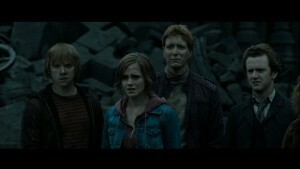 Although, knowing his brothers, Ron might have been skeptical about their practical wisdom.) In the end, we’re fairly certain Fred and George had a much better time at the dance than their brother did, though! ‘Who’re you going with then?’ asked Ron. ‘Angelina,’ said Fred promptly, without a trace of embarrassment. ‘Good point,’ said Fred. He turned his head and called across the common room, ‘Oi! Angelina!’ Angelina, who had been chatting to Alicia Spinnet near the fire, looked over at him. ‘Want to come to the ball with me?’ Angelina gave Fred an appraising sort of look. ‘All right, then,’ she said, and turned back to Alicia and carried on chatting, with a bit of a grin on her face. ‘You two passed your Apparition tests, then?’ asked Harry grumpily. ‘Mum thought we’d been duelling,’ said George. And in perhaps their boldest and best move of the series, Fred and George opted to turn their sights upon a truly worthy opponent in Dolores Umbridge. She had no idea what she was in for! ‘Have you ever?’ asked Hermione. ‘We’ve always known where to draw the line,’ said Fred. ‘We might have put a toe across it occasionally,’ said George. ‘But we’ve always stopped short of causing real mayhem,’ said Fred. ‘But now?’ said Ron tentatively. ‘Well, now –’ said George. 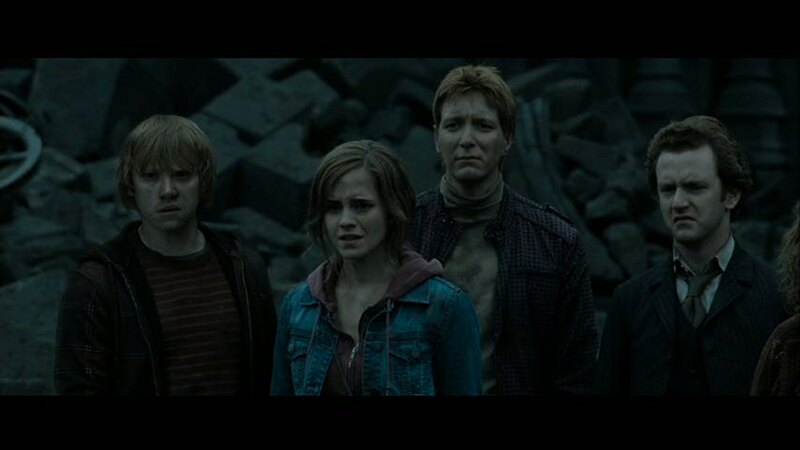 ‘– what with Dumbledore gone –’ said Fred. ‘– we reckon a bit of mayhem –’ said George. ‘– is exactly what our new Head deserves,’ said Fred. 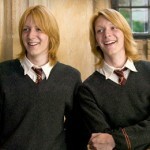 In fact, Fred and George starred in the showdown that left us all cheering–out-grown full time education, indeed! ‘Time to test our talents in the real world, d’ you reckon?’ asked Fred. ‘Yeah, don’t bother to keep in touch,’ said George, mounting his own. ‘Special discounts to Hogwarts students who swear they’re going to use our products to get rid of this old bat,” added George, pointing at Professor Umbridge. ‘STOP THEM!’ shrieked Umbridge, but it was too late. 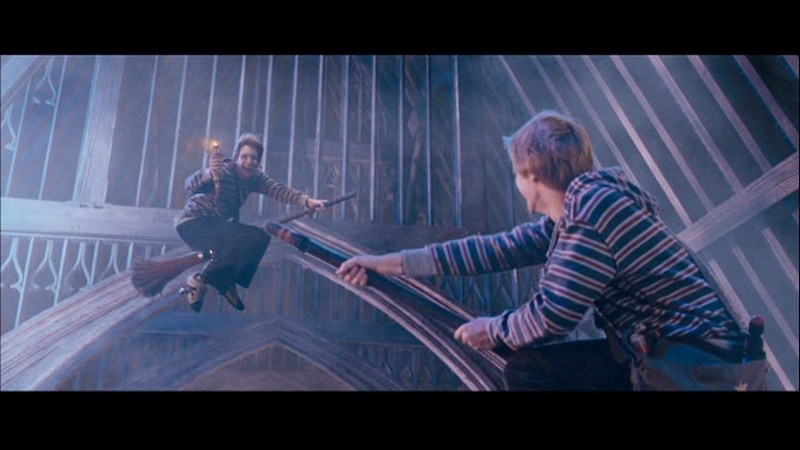 As the Inquisitorial Squad closed in, Fred and George kicked off from the floor, shooting fifteen feet into the air, the iron peg swinging dangerously below. Fred looked across the hall at the poltergeist bobbing on his level above the crowd. Fred and George did not feature in the sixth entry nearly as much, since they were off building their successful business in Diagon Alley. However, their influence on their family was not to be denied, and Rowling took every opportunity to imbue humor into the otherwise dark story with scattered references to our favorite twins. When he straightened up again, there were six Harry Potters gasping and panting in front of him. 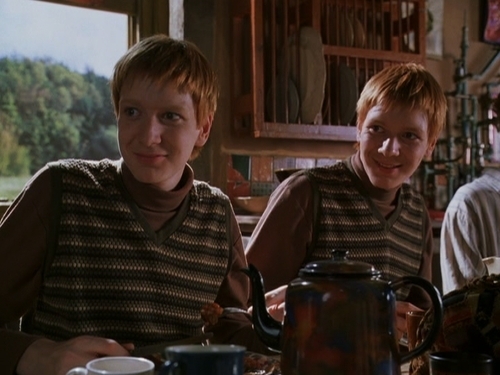 Fred and George turned to each other and said together, “Wow — we’re identical!” “I dunno though, I think I’m still better looking,” said Fred, examining his reflection in the kettle. Fred and George joined the Order at the Battle of Hogwarts as well, and in the midst of that horrific fight, it was a Weasley twin whose characteristic bluntness cut the tension of a long overdue family reunion. Levied at their brother, Percy, the message was clear–we will hold you to account. We won’t ignore the hurt you’ve caused. But we’re your family. Stand with us. We never stopped hoping you would. 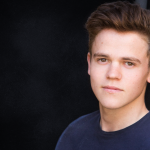 ‘Here, I’ve got a picture!’ Lupin shouted, pulling a photograph from inside his jacket and showing it to Fleur and Harry, who saw a tiny baby with a tuff of bright turquoise hair, waving fat fists at the camera. There’s not much more to say than this. 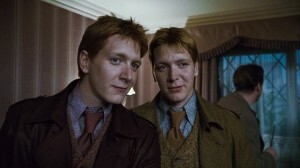 Fred and George loved their family. They loved life. Wholeheartedly. And at the end of the day, they were willing to fight for both. We raise our wands to the Weasley twins. Happy Birthday, boys. Thank you for the laughs and for showing us how to treasure each and every one! And many thanks to the Harry Potter Lexicon for compiling a good selection of quotes, some of which we used here, aiding us greatly in putting together a memorable tribute.